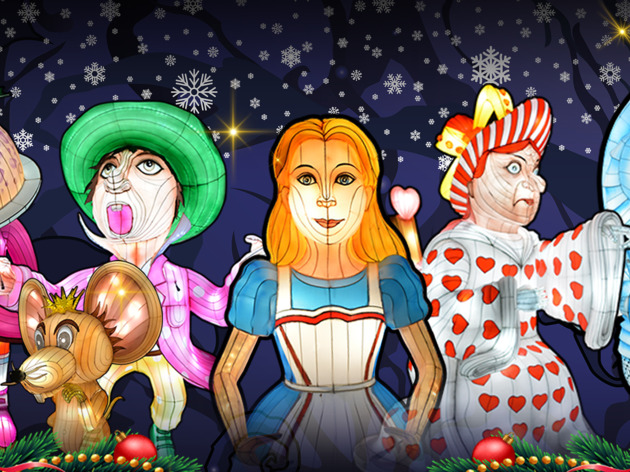 Follow in Alice’s footsteps down the rabbit hole and embark on a magical adventure through Winterland. 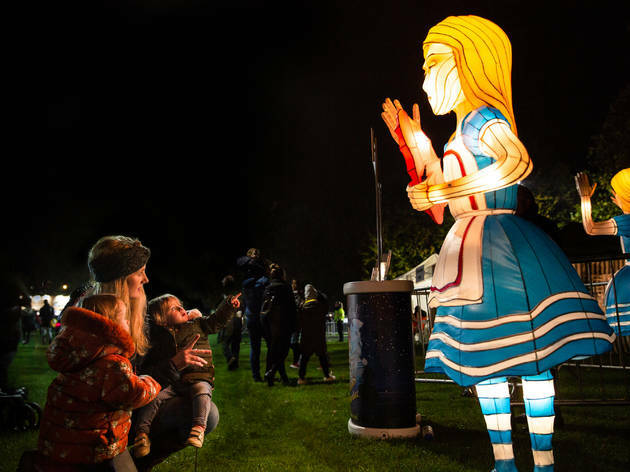 Bring the whole family to meet some of your favourite Carroll characters, with over 160 giant lanterns on display such as the Cheshire Cat and the Queen of Hearts. 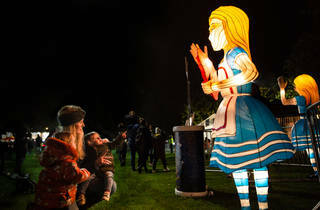 One of the real highlights is the five-metre tall Alice and a four-metre high white rabbit. Book your tickets in advance now. Awful. Broken lights, scary santa, ripoff food (4 quid for a small tray of anaemic chips! ), pay extra for the one ride, graffiti covered unwelcoming entrance. Everything about this is creepy and nauseating. You arrive at bermondsey Station, and see a bored man leaning on a sign pointing you in the right direction. Turn right out of the station and walk past all the drunks sat on the precinct, throwing takeaways at each other. When you arrive at the park the first thing you notice is the graffiti covered entrance walls - so festive! Onto the event itself; it's aimed at little kids but the statues are grotesque and scary. There are some scratchy quality audio clips with each scene that you can't really hear due to the poor quality recordings and the fact you are subjected to high volume 'Christmas classics' over the PA system constantly. The park is small and was very quiet when we were there, possibly 20-30 mins worth at a very slow pace. The food was overpriced and poor quality. was speaking to some local people on Saturday in a pub nearby and they are almost all hugely against this event on the basis that it closes off a large part of their park and is not accessible for many people that dont have large salaries. the event itself is underwhelmingly average; my 5 year old enjoyed it but my 7 year old was bored and wanted to drag me round to father Christmas as quickly as possible. the grotto is poorly designed and you have a time slot to keep to even though there was not a lot o people there - we had to wait for 30 mins to join a queue that didn't exist. the photos cost an extra £6 on top and were overexposed and looked like something taken on a Polaroid in 1978.
food choices weren't great and were very expensive. for a family of 4 it was £43 to get in, an extra £14 for the grotto, £6 for the photos and almost £50 on refreshments (3 burgers, one hot dog, couple of soft drinks and a beer). that is almost £120 for about an hours worth of time. comparing it to winter wonderland or kew gardens, it represents very poor value for money. I spoke to someone who got a significant discount on Groupon and i am very annoyed that this happened. Was going to take my kids this evening but tickets are £55 for a family of 4, and another £14 to see father Christmas on top. That's £70 almost before we've even thought about food. They are obviously aiming this event at affluent families, but going on the reviews I think they have no chance of getting people to come. I'll be taking my children to look at the twinkling lights in the west end instead, and saving my money for an event that's not quiet so crappy. If you want to give your children night terrors and spend a big wedge on tat then this is perfect. Words cannot describe how bad this is. Ripoff merchants. Lewis Caroll will be spinning in his grave. Exact Opposite to 'wonderous' , it was absolutely terrible. Boring empty flop. Staff don't seem bothered, from the man with the sign outside the swimming baths to the staff on the expensive food stalls. Utter bobbins. My kids wanted to leave after 10 mins. Very sparsely populated considering it's less than a week till Xmas. Spectacularly boring Christmas event. Even with the multiple discount sites offering cheap entry, it's still not worth it. The food stalls are overpriced too. A load of old pony and trap. It would have made a better scare exhibit, it was a ghost town. So crap I want my money back! This was not much fun. It was freezing and empty the weekend before Christmas. I'm very angry u had to pay extra for the grotto, and extra still for the 'photos' that were blurred. Whole place is designed to make you part with as much cash as possible. We didn't feel welcome even though there was only a couple of other people there. I agree with all the other poor reviews, it was boring. Crappy. Nothing else to say really. What a mess - badly organised and very boring. Went last night (12/12) at 7pm and we were the only ones there. I assume someone has lost a lot of money on this venture. Would not recommend unless you really like your own company. On a scale of 1 to 10, I'd give it a 0. So dull. Never been so bored in my life and my kids HATED it. Grim part of town, dirty dark Park and lots of unsavoury characters loitering around. Winterland itself was not very interesting and the constant drone of tinny christmas hits will bore into your mind like a dentist doing a root canal. About as interesting and exciting as a walk round the North Pole. It's terrible. Expensive to get in, nothing to do except look at some light up statues, the grotto costs extra and father Christmas looks like he couldn't care less. Even the teacups ride costs extra! Just a couple of quid cheaper than Kew Gardens, which is amazing. This however, is not amazing. Its very far from amazing in fact and I was bored rigid. Ruined a grade II listed victorian Park in the name of profit. 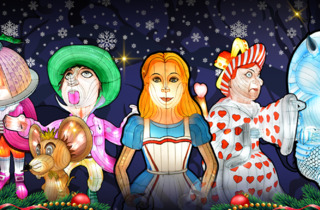 the costs are scandalous, its just a few crude lanterns depicting a story that everyone knows. What can I say - this is the most uninteresting Christmas experiemce I've ever seen. The lanterns are frightening in places for little children. It's not worth the steep entry price. Spend your money on something else! It's Friday night and there is nobody there. What a huge debacle this has been. Expensive. Not worth the entrance fee. absolute rubbish - overpriced and boring. have to pay extra for Santa and under 3s dont get a goody bag.